The work may be described as an anti-thesis of James Turrell’s light installations of geometrical perfection, hinting at subliminal bliss. Here, it is conceptually intriguing, but less so if you consider the collective experience of seeing it with running children and blisters of mobile phone light. We are more fearful of the dark than we think, or we are more reliant on artificial light than trusting our natural, adjusted vision. It can also be described as the industrialised version of Anish Kapoor, working with the negation of light. Kapoor “renowned for his enigmatic sculptural forms that permeate physical and psychological space” was also commissioned in the same Tate Modern Unilever series in 2003, in Marsyas (2002), “explored what he sees as deep-rooted metaphysical polarities: presence and absence, being and non-being, place and non-place and the solid and the intangible”. Darkness, and fear of it, are just as non-place, and intangible. It also reminds me of Singapore artist, Heman Chong’s plants (2008), consisting of a darkened corridor with black painted artificial plants. Plants is deliberately barely lit, provoking a struggling vision or comprehension of global destruction and the due detrimental effects afflicted by people. You may interpret the trees as dying, or overwhelmed by nuclear radiation, fried, by mankind, into charred-ness. That is how it is. There is a sense of resignation with the title of the work. That is how it is. A tone of matter of fact accepting one’s fate. We can be led to be convinced, by artificial darkness — a metaphor perhaps for ignorance — is actually a circumstance we can choose to walk out from. Or it was something we chose to walk into in the first place. The work, in it’s powerful scale and dimension echos more than participatory running footsteps and blinks of light. Read about How it is and a documentary at http://www.tate.org.uk/modern/exhibitions/unilevermiroslawbalka/default.shtm, accessed Feb 18, 2010. The installation by artist Lim Shing Ee plays with whimsical, dream-like objects set in a portal that opened at sculpture square gallery. Look careful enough, you will spot a few consistent motifs, such as miniature red and white balloon-like forms, shadows that take uncanny 3D form, and featureless 4 legged ‘creatures’. In less psychedelic fashion than Japanese animated science fiction film, Paprika (2006), the installation Drawing Circus puns on ‘drawing circles’ and suggesting a playground for objects that were drawn and coming alive. At the far end of the chapel gallery, a black fork tongue unrolls from a porthole window. On the left side of the gallery, a pink shadow of a 4 legged creature, cast by a sinking brown object. A headless 4 legged form perches on top, with another taller form on top, and another tiny red one on top. In a similar enchanting fashion, a brown soft-toy creature-object sits on a wooden cactus, and a long string stretches across the gallery, like preparing for a flying trapeze. Instead of hurling similarly bodied soft toys, we see ‘3D shadows’ strung on it, oddly shaped yet again. On the right side of the gallery, you will find prints of drawings, proudly displayed like photo frames of portraits of these featureless objects, at play – prancing, pausing, melting, meditating. 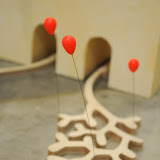 The impetus for the installation would probably come from the drawings, itself an activity of playing with the line, or what Paul Klee calls “… taking a dot for a walk”. Similarly, the forms presented here are objects born to this world by taking the imagination to a circus. A circus here, does not simply mean “a travelling company of performers that may include acrobats, clowns, trained animals, trapeze acts, musicians, hoopers, tightrope walkers, jugglers, unicyclists and other stunt-oriented artists”. Nor is it in grand Cirque Du Soleil mannerism. “Circus of the Sun”, often regarded as a contemporary circus, by mixing great fantasy, lavish costumes, circus arts in a dazzling theatre-style, themed, with flowing narratives. A circus here, portrays the artist as circus master, the gallery a marque, and the installation referring to the performers. These objects, or creatures appear tamed, perhaps to the delight of some. To others, they are playful and may remind one of the elephant being digested in the boa constrictor, seen in Antoine de Saint-Exupéry’s Little Prince (1943). In looking for a sensible explanation for these strange, tamed creatures, we lose the delight in their formless-ness, or lack of exactitude; guidelines, restrictions that are matters of grave consequence. Like imagination on a trapeze, a leap of faith, abandoning gravity (of grave consequences) might just be what we need to appreciate the composition and arrangement of the work. One has to believe in what one is doing, one has to commit oneself inwardly, in order to do painting. Once obsessed, one ultimately carries it to the point of believing that one might change human beings through painting. But if one lacks this passionate commitment, there is nothing left to do. Then it is best to leave it alone. For basically painting is total idiocy. – Gerhard Richter, The Daily Practice of Painting, Thames and Hudson 1995. To work small may be a strategy to deal with space constraints. In the case of these 10 artists, they deal with more than scale, tackling wide ranging issues and themes from vernacular film and the task of re-painting Infernal Affairs, emotional ambivalence in the small screen animations of Justin Wong to subliminal miniature panoramas that deal with the ‘debris of memory’.